Food Photographer & Stylist - Motif Lifestyle Images Ltd.-Who's counting the calories...? Place sugar and 2 tbspn water in a small saucepan over medium heat. Swirl to dissolve sugar, then cook for 6-7 minutes or until golden. Remove from heat and carefully stir in butter and cream. Cool to room temperature. Combine the flour, baking powder, cocoa, sugar, egg yolks and buttermilk in a bowl. In a separate bowl, whisk the egg whites to soft peaks. Fold one-third into the batter to loosen, then fold through remainder. Heat a little butter in a non-stick frypan over medium-low heat. In batches, add ½ cup batter to the pan for each pancake. Cook for 1 - 2 minutes or until bubbles appear on the surface, then flip and cook for a further 2 minutes or until cooked through. Cover and keep warm while you repeat with remaining batter, adding more butter as needed. Whip cream to soft peaks with vanilla essence and caster sugar. 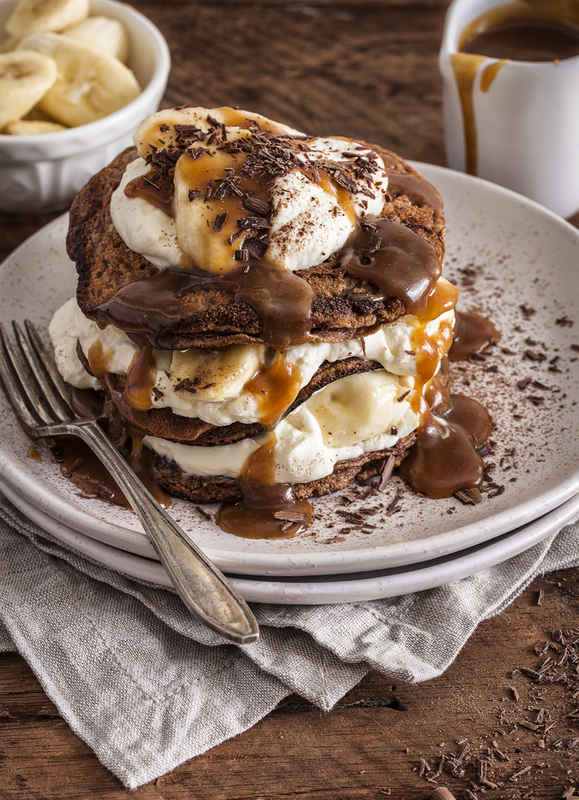 Layer the pancakes in stacks with the whipped cream and banana. Drizzle with the caramel sauce, scatter with shaved dark chocolate and dust with cocoa. Serve immediately.